A native of East St. Louis, he attended Central Catholic High School where he participated in football, basketball and baseball. In 1947, he was named the school's Athlete of the Year and was named to the St. Louis-area All-Star football Team. He was Quincy College's Most Valuable Football Player in 1950, and in 1974 he was one of the first inductees into the school's Hall of Fame. He signed a professional baseball contract wit the St. Louis Cardinals organization in 1951, and he led the Midwest and Western Association leagues in hitting before being called into the armed services. A serious arm injury ended his playing career, and he began his coaching career at Effingham St. Anthony in 1954, His three-year coaching record here was 89-8. He began a 10-year career at Cathedral High School in 1957, posting a 170-83 record. 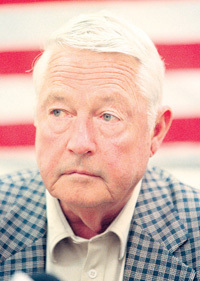 He also rejoined the St. Louis Cardinals organization in 1957 as a scout, and he has been responsible for getting 18 players into the major leages, In 1990, he was voted Midwest Scout of the Year by the Chicago Pitch and Hit Club, and he received a similar award from the Illinois High School Baseball Coaches Association in 1993. He also was instrumental in the formation of the Central Illinois Collegiate League in 1963. A native of Liverpool England, he had one of the greatest amateur golf careers in Springfield history. He won a record six men's city tournament titles, a mark equaled by his brother and felllow Hall of Famer, Bobby. Ed Charlton's first city title came in 1926 when he was 18. He shot his age - 72 - on his final birthday in 1980. He also was an outstanding bowler, and in 1982 he was inducted into the Greater Springfield Bowling Association Hall of Fame. He captured the all-events and singles championships in the 1958 Elks State Tournament in Joliet. At the 1963 American Bowling Congress Tournament in Buffalo, N.Y., he shot his first 700 series, a 703 on games of 228, 243 and 232, to place 12th in singles. He was a member of the GSBA All-Star team in 1963. Lanphier High School graduate began auto racing in 1951 and got on the USAC circuit in 1958 in the midget division. He was the Illinois-Missouri stock car champion in 1955, 1956 and 1957. In 1961 he was awarded the Johnny Thompson Memorial Award by the Hoosier Auto Racing Fan Club as the most improved driver in the country. In 1962 he finished eighth in the USAC national midget standings, 10th in the USAC national sprint car standings and 14th in the national chamionship division (Indy cars). He was killed while racing in Dayton, Ohio, on June 3, 1963, and at the time of his death he was second in the sprint car standings. He was a two-time starter in the Indianapolis 500, after the 1963 Indy 500 he was awarded the Angelo Angelopolous Award for sportsmanship by the Automobile Writers of America. Riverton High School 1943 graduate who played varsity basketball for four years and averaged 20 points per game and also competed on the track team as a junior and senior. After graduation he played baseball (catcher) and basketball in the Springfield Recreation Department's Muny Leagues. He played twice in the AABC national tournament in Battle Creek, Mich., hitting two home runs in one game to tie a tournament record set by major leaguers Al Kaline and Gil Hodges. In 1959 he was awarded the Amateur Baseball Player of the Year for the decade of the 1950s, In basketball, he was a key member of the One Day Cleaners team that dominated the local Muny League and played in two AAU national tournaments in Denver. He also has served as a youth baseball coach and basketball official. Springfield High graduate who played basketball on the 1917 state championship team. He was an all-state tackle in football in 1916, was a four-year letter-man in basketball, football and track. He was captain of the Northwestern freshman football team in 1917 before enlisting in the United States Navy and was assigned to the Great Lakes Naval Training Station in Chicago. He played on the Great Lakes team that beat Mare Island Marines 17-0 in the 1919 Rose Bowl. He returned to Northwestern after receiving his honorable discharge from the Navy in 1919 and was a basketball and track letter-winner, setting a school pole vault record. He later transferred to Washington and Jefferson in 1919-20 and was an All-Eastern halfback and member of Grantland Rice's All-American backfield. He also served as mayor of Springfield, and in 1950 he teamed with Joe Bukant to win the YMCA handball championship. Southeast High School graduate (1971) who played football, basketball and baseball and ran track. In baseball, he was the center fielder and leadoff man on the 1969 Colt League All-Star team that finished second in the World Series. He played for City, Water, Light and Power and then the Springfield Steelmen for several years. He was a quarterback in football who was second team all-city (behing Jim Kopatz) in 1970. In track he set the City Meet long jump record of 23-11" in 1971 that still stands, the longest-standing record on the books. He was fourth in the state meet in the long jump as a senior. He was a four-year track MVP at Bradley University and is a member of the school's Hall of Fame. In 1974, he was named the school's Outstanding Athlete. He won the Missouri Valley Conference long jump title as a sophomore. Pleasant Plains native who began pitching softball when he was 15 years old and played for 45 years. Considered the top fast-pitch softball pitch ever to come out of this part of the state, he made the All-State eam six times and pitched six perfect games and 12 no-hitters. He was a member of the 1973 Quality Furniture team that won the state title and a member of the Loami Merchants team that was second in the state tournament in 1959. He played for 17 different teams during his career and called just playing softball "a grat honor." He also played with his son, Gregg, for 17 years. In July of 1995, he was inducted into the Illinois Amateur Softball Association Hall of Fame. Played semi-pro baseball for 23 years and spent two seasons in the Three-I-League with Bloomington (1934) and Springfield (1935). From 1926-53 he played for Lincoln Cash Market, Saratoga Cleaners, Peabody Coal Mine, Italian Americans, Fitzpatrick Lumberjacks, Roseberry and Sherman Athletic Club. He reportedly compiled a .402 career batting average in 28 seasons. He played on 10 Muny League championship teams. In 1944 he played in a all-star game against Great Lakes Naval Statrion and got one of his team's two hits off major league Virgil Trucks, In 1945 he was co-MVP of an all-star game against the Pittsburgh Pirates, going 3-for-3. A former bowler and golfer, she's considered one of the Springfield's best female athletes. She played softball and golf, bowled and ran track. Her bowling career began in 1942 and spanned 29 years, and during that time she won or shared 20 singles, doubles, all-events and team scratch titles in the Springfield Women's Bowling Association tournaments as well as six handicap titles. She was a co-founder of the Round-The-Town tournaments in 1950. In 1991, she was selected as one of the five best women bowlers of all-time by Kau Baugher, SWBA historian. She was active in golf and one of the founders of the Springfield Women's Golf Association. She was a member of the 1954 Public Parks team that won the city championship. THE 1917 SPRINGFIELD HIGH SCHOOL BOYS BASKETBALL TEAM. Won the 1917 state title 32-11 over Belvidere to become first school in the city history to ever win a state title. Harry Eielson was the star player on this team. Ed Alsene - Bloomington native (Normal Community High School graduate, 1941) who served as a sports editor of both the Illinois State Journal and the Illinois State Register for Aug. 1, 1959 until August of 1965. He replaced Hall of Famer Bob Drysdale as Journal sports editor and eventually served as the sports department head for both of the newspapers. He played a big part in the formation of the Central Illinois Collegiate League iun 1963. As sports editor of the Journal and Register, Alsene improved local coverage through the use of full box scores and locally oriented feature stories. He left Springfield to become Director of Publicity of Sports Information at Illinois Wesleyan. He retired from that position in November of 1988. He's a member of the Illinois Basketall Coaches Association Hall of Fame and the College Sports Information Directors Hall of Fame, and while at Illinois Wesleyan his annual sports brochures won numerous awards. Bill Chestnut - Behind-the-scenes guy who kept the Greater Springfield Bowling Association together for 40 years. An outstanding bowler, his high series was 706 and he's bowled 280 games, he began serious league competition in 1955. He got into the administrative end in 1958 as the secretary of a summer league, and in 1960 he was elected to the GSBA board of directors, and he served on the board in various capacities until his retirement in 1995. He also served as bowling writer for the Springfield Sun newspaper from 1967-72. In addition, he was elected as a director of the American Bowling Congress in 1972 and remained in that position for 20 yeaers. In 1992, he was elected as a life member of the ABC. He's also a member of the GSBA and Illinois Bowling Association Halls of Fame. Pete Salvo - 1950 graduate of Cathedral High School, he was active in fast-pitch softball from 1946-80. He also sponsored teams for 30 years, including such highly regarded fast-pitch teams as Platter Record Shop and Quality Furniture, the 1974 state championship team. He also coached baseball and softball for nearly 20 years. In 1985 he was inducted into the Illnois Amateur Softball Association Hall of Fame. Sandy Wands - Southeast High School teacher who spent eight years as the school's cheerleading sponsor, and during that time her teams finished among the top 10 in national competition seven times. She also was a pompon sponsor for six years, Student Council sponsor for 25 years and spent one season as girls track coach - eight of her girls qualified for the state meet.